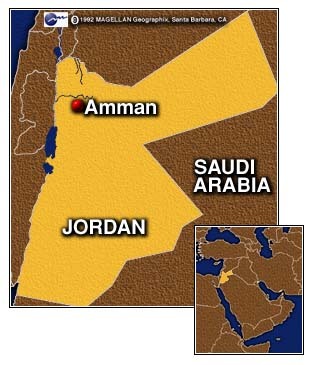 AMMAN, Jordan (CNN) -- A diplomatic flap, sparked by Palestinian Authority President Yasser Arafat's wife, continues to dog U.S. first lady Hillary Rodham Clinton during her Mideast trip. On Friday, Clinton dismissed as "baseless" Suha Arafat's remarks that Israel had used gas and chemicals to poison Palestinians. "Everyone who supports this effort toward resolving outstanding issues among the parties should refrain from inflammatory rhetoric and baseless accusations," Clinton said while visiting Jordan's tourist city of Petra. Clinton suggested that Arafat's remarks could damage the final stretch of the Mideast peace talks. Israel is due to hand over another 5 percent of West Bank land to Palestinian control on Monday. "I will go anywhere any time I can to promote the peace process," Clinton said. The Palestinians, who control approximately 30 percent of the West Bank, expect to control 40 percent of the region next year. 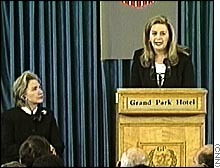 Clinton said she waited a day to respond so she could receive a precise translation of Arafat's remarks. On Thursday in the West Bank town of Ramallah, Arafat accused Israel, while Clinton was in the audience, of "consistently and daily using poisonous gas against Palestinians for the past years." This, she alleged, increased cancer rates among Palestinian women and children. Arafat also accused Israel of contaminating 80 percent of Palestinian water supplies. Her remarks sparked outrage in Israel and dismay in the United States. Clinton drew fire from New York City's Republican Mayor Rudolph Giuliani, widely regarded as a prospective opponent if the first lady decides to seek the Democratic nomination next year for the U.S. Senate from New York. Giuliani scolded Clinton for not speaking up immediately. The Palestinians apologized Friday, saying Arafat had not intended to embarrass the first lady, and that she got her words mixed up. 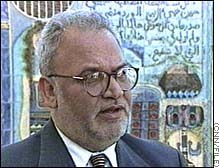 One senior Palestinian official, who requested anonymity, said an irate U.S. President Bill Clinton demanded an apology. Palestinian peace negotiator Saeb Erekat said there had been no intention to embarrass the first lady, "and we are very sorry if there was any embarrassment caused. "Of course, Mrs. Arafat did not mean poison gas, but tear gas," Erekat told Reuters. "We agreed with President Clinton that the Palestinians and Israelis must resolve their differences through dialogue and negotiations." Jerusalem Bureau Chief Walter Rodgers and Reuters contributed to this report.